I imagined him in his beloved Brooklyn, strolling in Prospect Park and preaching to chance comers about his gospel of good books. "When you sell a man a book," says Roger Mifflin, the sprite-like book peddler at the center of this classic novella, "you don't sell him just twelve ounces of paper and ink and glue—you sell him a whole new life." 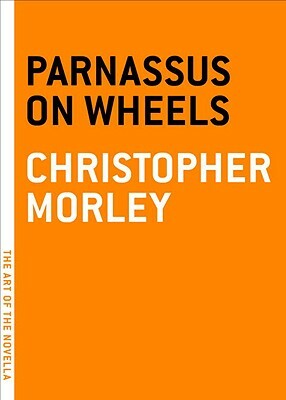 In this beguiling but little-known prequel to Christopher Morley's beloved Haunted Bookshop, the "whole new life" that the traveling bookman delivers to Helen McGill, the narrator of Parnassus on Wheels, provides the romantic comedy that drives this charming love letter to a life in books. Christopher Morley (1890-1957) was a New York newspaper columnist who wrote over one hundred books, including the bestselling novels The Haunted Bookshop and Kitty Foyle, which sold over a million copies and was made into a hit Hollywood movie. "Don’t let its small size deceive you..the story of a traveling bookseller and the unexpected love he finds when selling his bookmobile packs a big heart."